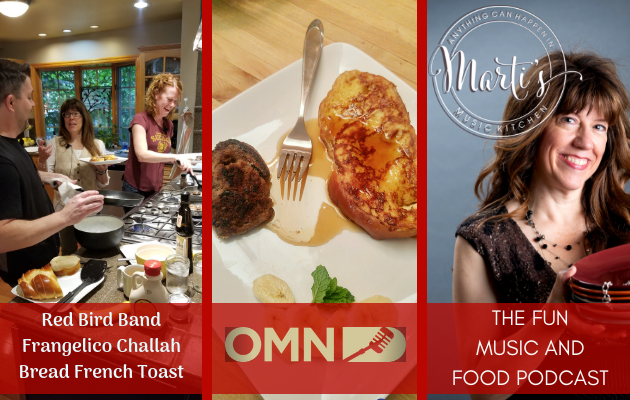 On Episode 6 of Marti’s Music Kitchen, we are cooking up breakfast with the wildly soulful Red Bird Band. As a musical partnership between Bre Gregg and Dan Gildea, they have already received noted acclaim as one funky, beautiful and bluesy package. “This is a song that’s all about how to work super hard to get to someplace in life, and then when we get there we realize that it didn’t matter at all,” say Bre of a song they composed together for their upcoming CD. “The only thing that matters is the loved ones in your life and living right now in the present moment. Bre and Dan are both parents, and have learned to juggle cooking, family and parenthood with rehearsing and late-night shows. On the menu is Delicious Frangelico Challah French Toast, one of Dan’s family favorites. It blows me away at how these two make being successful musicians and successful parents look so… graceful. How do they do it all and manage to cook breakfast? Give it a listen – and let’s go find out! http://Patreon.com/MartiMendenhall - This episode supported by Patrons just like you! Add eggs, milk, salt, sugar, and Frangelico in a large mixing bowl. Mix with a whisk or fork until blended. Heat a large cast iron or non-stick skillet (med-high heat). Add a generous amount of butter to the pan. Dunk slices of challah in the egg mixture and set in the pan. Brown on both sides and serve. Serve with maple syrup, whipped cream, fresh fruit, and sausage.